Occupy Cal has moved their encampment to Doe Library. Compared to previous encampments, there is almost no police presence. In a shift from the massive police presence at the first Occupy Cal encampment in November, UCPD has not confronted the camp established last Thursday, aside from announcing general dispersal orders nightly. The Occupy Cal camp, which moved from the steps of Sproul Hall to those of Doe Memorial Library on Tuesday, has gone mostly unwatched by UCPD officers, according to UC Berkeley senior Alex Kim. 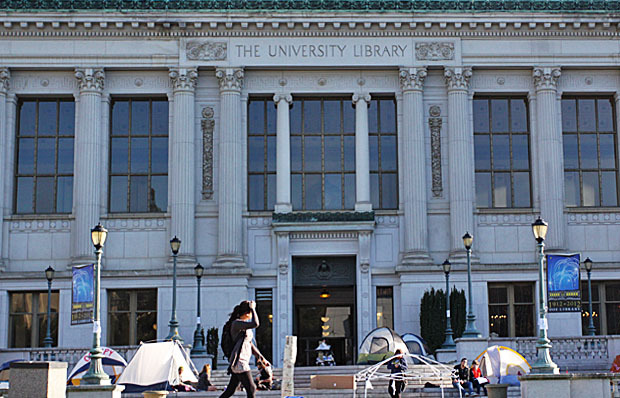 Under the California Education Code, people on UC campuses cannot bring tents or set up a campsite without authorization from a university official. When the first tents were being erected on the UC Berkeley campus on the afternoon of Nov. 9, at least 50 officers from UCPD and Alameda County Sheriff’s Department physically confronted the hundreds of protesters, making arrests, taking down the tents and allegedly injuring several people. After the camp was established, several UCPD officers were positioned near the it to keep watch of the protesters at all times until the camp was cleared out eight days later. According to Kim, the most interaction the protesters have with UCPD during the current encampment occurs when two officers stop by the camp nightly — one reads the dispersal order, the other videotapes, then the two return below Sproul Hall. UCPD spokesperson Lt. Eric Tejada would not confirm how many officers have been assigned to watch the camp, but he said UCPD monitors it on a regular basis. While some Occupy Cal protesters think the change in UCPD’s approach is in response to the alleged Nov. 9 violence as well as the pepper-spraying incident at UC Davis, UC Berkeley Associate Vice Chancellor of Public Affairs Claire Holmes attributed it to the circumstances that have surrounded the encampments. The current Occupy Cal camp consists of 10 tents and not many more protesters on hand at any given time except during general assemblies. Camps at other UC campuses have also met little police resistance recently, although no universitywide police policy has changed, according to UC spokesperson Dianne Klein. Four days after first appearing on campus Nov. 14, Occupy UC Davis drew national and international attention when Lt. John Pike of UC Davis Police Department pepper-sprayed approximately 15 seated protesters. That encampment returned to campus Jan. 9 and has been met with little resistance from the UC Davis Police Department, even though encampment members have blockaded the door to the on-campus U.S. Bank location at least eight times. The Occupy UC Riverside camp — established before the Jan. 18-19 UC Regents meeting on campus — has remained despite alleged violence at the meeting and a dispersal order sent to the protesters from UC Riverside Chancellor Timothy White on Tuesday. UC Berkeley graduate student Joshua Anderson — who has participated in both Occupy Cal encampments — said he is glad he has not been beaten or forced out but does not feel any sympathy from UCPD officers. “The whole point of why we’re out here is to break the rules a little,” Anderson said.